This article was published in the Southport Magazine (Vol 2 Issue1). In 1940, No. 14 Elementary Flying Training School was located where Southport is today as part of the British Commonwealth Air Training Plan. After World War II, the base became temporarily inactive. The Royal Canadian Air Force (RCAF) expanded to the site in 1952, and opened RCAF Station Portage la Prairie. It housed No. 2 Advanced Flying School which trained RCAF and NATO pilots. The station was renamed Canadian Forces Base Portage la Prairie in 1966 and employed between 800-900 military and civilian personnel during this time. In 1988, the Federal Government announced the closure of CFB Portage la Prairie due to budget cuts in the Department of National Defense. The closure relocated 500 military personnel and removed 200 jobs for civilians. Citizens of Portage la Prairie rallied together to form the "Save the Base Committee," to ensure flight training remained in Portage la Prairie. They worked to advocate and lobby to raise awareness of the importance of the economic impact of flight training to the local community. After increased efforts and media coverage, the Federal Government announced the formation of Southport Aerospace Centre Inc. (Southport) in 1990 to take over the assets of the former CFB Portage la Prairie and continue flight training after privatization. Southport was established as a not-for- profit, non-share Capital Corporation with an initial Board of Directors selected by the Federal Government from all walks of life. Southport also created a Genera Membership of about sixty-five members who have no equity in the corporation. They hold the Board accountable to the public to protect sound governance, and to ensure long term viability of the property. to Southport's status as a not-for-profit, non-share Capital Corporation, all excess revenue can be invested back into the site without any dividends or corporate taxes being deducted. Some of the upgrades done during this time included: the construction of Alan McLeod Building in 1999, which has accommodations for up to 96 flight training students and the expansion of the Southport pool to include a waterslide, kid's area and hot tub. Improvements also included changes to site infrastructure, upgrades to the airport and airfield as well as demolishing buildings that had reached end-of-life. Wherever possible, these buildings were put to other uses, such as being donated to the Fort La Reine Museum in Portage la Prairie. The streets in the commercial area were changed from their numerical designations and renamed after the different aircraft historically used for military flight training. Airport Technologies Inc, (which manufactures airport snow clearing equipment) started at Southport during this time, as did Addictions Foundations of Manitoba, a residential youth treatment facility. Southport also gained education facilities, including Assiniboine Community College, Red River - Stevenson Aviation (which trains Aircraft Maintenance Engineers) and Accelerated Christian Education, which now owns their own building. The regional health authority, which would later become Southern Health - Santé Sud, was also a tenant at this time. In addition, the bowling alley and golf course on site were also leased out. In this contract, Southport experienced air shows, hosting athletes for the 1999 Pan Am Games, hosting the Winnipeg Blue Bombers Training Camp, celebrating the 60th anniversary of flight training and many other events. This time period was formative in establishing Southport as we know it today. In 2005, Southport entered into a new contract until 2027 with the successful bidder in the new flight training contract: Allied Wings (now KF Aerospace). KF Aerospace is a significant partner for Southport, as they use a substantial number of services and site infrastructure. This period saw a focus on growth and expansion. In preparation for the new contract, Southport demolished and replaced Hangar 1 and 2 in 2005-2006. Hanger 3 and 5 were also demolished to make room for new growth. Hanger 4 currently houses Red River College - Stevenson Aviation. The Hilly Brown Building and Barker Building were also constructed during this contract. Hilly Brown (built in 2007) houses a first-class flight training program that utilizes classroom space, flight training devices, simulators, and training support facilities to instruct students, while the Barker Building (built in 2010) is a modern accommodation building with 52 suites suitable for short or long-term stays. More recently, the former Southport Recreation Centre was upgraded into the newly opened Central Plains RecPlex, which features modern recreation for all ages and a variety of interests. Upgrades to the facility include a 9 metre climbing wall and an indoor track, among others. Southport gained new tenants during this contract. The tenants still here today include Nutri-Pea Limited, which leases the warehouse, and some support contractors for the military flight training contract. Most recently, Portage Day Care and Sawmill Tea + Coffee Co. are leasing space in the Central Plains RecPlex. air shows, and hosting the military personnel that arrived to assist Portage la Prairie with the Flood of 2011. More recently, Southport has hosted student Unmanned Aerial Vehicle (UAV) competitions, fundraising golf tournaments and events for residential tenants, including the now annual community barbeque and yard beautification competition. These are just some of the many events that have happened at Southport. In 25 years, Southport has come a long way. In the early days, Southport focused on converting from a military base to a commercial site. Now we continue to expand and innovate to promote continued growth at Southport. Southport is proud to contribute significantly to the local economy through a direct impact of $111 million of economic output, 570 jobs, $67 million in GDP and $33 million in income. We have had over 50 tenants during our 25 years, with many still here today. 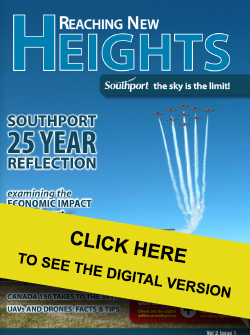 As a property management and development company, Southport has diversified its tenant base to include health administration, education and training, manufacturing, addictions counseling, childcare, food services, and support services for the military flight contract. Southport strives to ensure that the facilities our tenants use fit their needs based on their unique requirements. We are committed to providing quality customer service and establishing a sense of community around Southport that will enrich the experience of doing business with us.